Information on the foremost Royal Worcester Artists; everyone from Charles Baldwyn to Hadley, Sebright and Doughty. 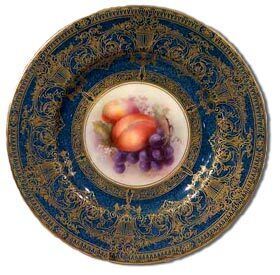 Over the years Royal Worcester and all of its many incarnations have employed or been associated with some of the best and most innovate ceramics artists. The artists detailed below are currently a very small selection of these but we hope to grow this list extensively over the years. Although Worcester porcelain takes a great many skilled hands to manufacture, from around the year 1900 Royal Worcester allowed their artists to mark the work they produced. Royal Worcester allowed the artist to sign the work on the front face rather than include a monogram within the Worcester base marks. 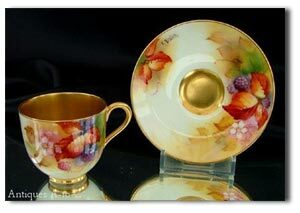 Kitty Blake worked at the Royal Worcester factory for 48 years from 1905 until 1953. She specialised in flowers and small fruits. She also created several designs featuring blackberries and buttercups. Kitty blake had previously spent time at James Hadleys factory in Diglis road and her Hadley style rendering of bunches of blackberries have become the Kitty Blake signature pieces. They are mouth-wateringly real and much sought after by collectors. 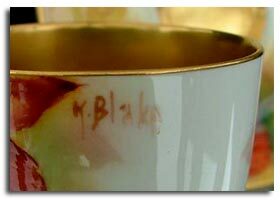 Like so many other famous ceramic painters, Kitty Blake seems to have come from an artistically talented family, her brother Edward worked for the Locke factory as a painter of Pheasants. Kitty was seen as a team player with a good sense of humour and Kitty Blake became very popular at the Royal Worcester factory. She was considered to be a bit of a live wire in her younger days and if the male painters of the time, had their terrible seven apprentices, then the female painters had their Saucy Six who would terrorise any male staff that upset them. Kitty Blake was a leading light in this group and they made their presence felt both inside and outside the Worcester factory. Kitty Blake was a driving force at the Worcester factory throughout her long stay. Times were hard for much of it and she would spend her spare time making advertising posters for events held at the Royal Worcester works. She is said to have had that common touch and was never seen without her red lipstick and cigarette. Born in Worcester in 1890, Harry Austin trained as an artist from an early age and won many medals for the drawings he produced in his younger years. He is believed to have started at the Royal Worcester factory with his younger brother Walter in 1910. Harry Austin became a highly skilled and wide ranging artist. He produced stunning studies of birds including a particular series of Australian birds for the export market, fruit subjects, plants and flowers. He was also responsible for the newer versions of the old Worcester Fancy Birds on the blue scale grounds. In the 1920s, hard times came to the quality porcelain market and a great many painters had to find ways to boost their meagre earnings. 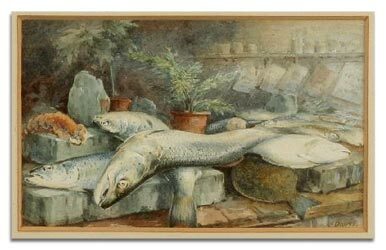 Harry turned to producing watercolours, of the same style that he painted at the factory, on canvas, card, paper or plywood. He then touted them around the local inns and cafes. In 1930, during the great depression Harry austin left the Royal Worcester factory to concentrate on the freelance design work with his brother. In 1931, after limited success with his freelance work he became the resident designer for Paragon China. While at Paragon Harry produced a design featuring love birds with flowers, for Her Majesty Queen Elizabeth the Queen Mother, to commemorate the birth of her daughter Princess Margaret. However, unhappy with life in the potteries Harry eventually returned to Royal Worcester, but not the Worcester factory, and continues his freelance design work. Richard Sebright is possibly the most highly regarded Worcester fruit painter of all time. He worked at the Royal Worcester factory painting fruit for a total of fifty six years and during all of that time was never to make what you might call a decent living at it. 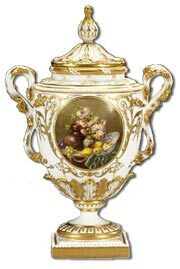 Royal Worcester artists and painters were paid piecemeal, that is, the more they produced the more they earned. But Richard Sebright was so painstaking in his work, so determined that each piece would be the best that he could produce, that he was never able to work fast enough to earn as much as many of the others. It is said that he was a very religious man who never married. His religion and work were all that mattered to him and the level of his earnings was considered to be of only minor importance. He was considered to be the best living painter of fruit by his fellow fruit painters. William Hawkins was the foreman of the Royal Worcester mens painting room throughout most of the 1920s. He is one of the most respected painters to have worked at Royal Worcester. He is not renowned for his fruit paintings, although he was certainly more than competent. His real love and his best work was in his Royal Worceter portrait and figural subjects. William Hawkins retired in 1928.